03/17/2011 2:52 PM - DES MOINES – Iowa Barnstormers Head Coach and Director of Football Operations announced today that former University of Iowa All-American quarterback, Brad Banks, will start at quarterback when the 2011 season opens on Saturday night. The announcement comes after an intense training camp battle between Banks and Bryan Lee-Lauduski, a product of Southern Oregon. Banks, who led the Hawkeyes to a share of the 2002 Big Ten title, finished his collegiate career as one of the most decorated players in Iowa history. He won the Davey O’Brien Award as the nation’s best quarterback, was named the Associated Press College Football Player of the Year, and received All-American recognition from numerous media organizations. Banks also finished second in the 2002 Heisman Trophy balloting to Southern California’s Carson Palmer. Kickoff on Saturday night in Pittsburgh is scheduled for 6:30p.m. You can hear all the action Live with Larry Cotlar on AM 1700 the Champ. The Barnstormers will also be holding a watch party at Bennigan’s, located at 1810 Army Post Road in Des Moines. Iowa returns home Friday, March 25 to battle the defending AFL champ Spokane Shock. 2011 season tickets remain on sale beginning at just $117 per seat and can be ordered by calling 515-633-2255. 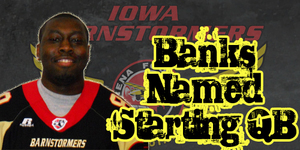 Fans can also visit www.theiowabarnstormers.com for more information.